at the above chemical waste lagoon historically? WHY DID WE ASK THIS? A documented white phosphorus fire occured at the site in 1989 when a tanker driver emptied some barrels containing waste onto “the beach area”. On 25/5/09 after Rhodia removed barrels that had been set in the sediment for several years, a fire occured at the source of their stored location. This was a hot day. There is little doubt that this fire was started by the white phosphorus drying out and catching fire. Rhodia however tried to deny this. This attracted local community interest and concern given that it was visible from houses, and also the fire service could not gain access to the site. 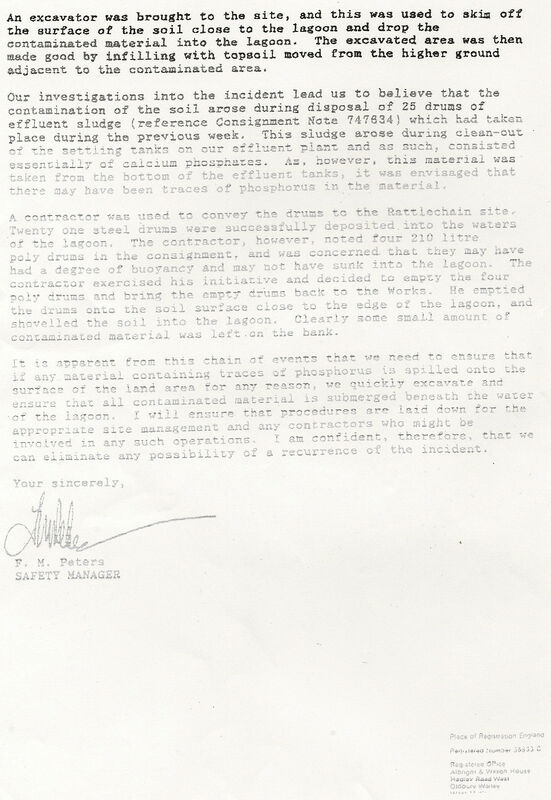 We wondered if any special arrangements were in place between the company and the fire service concerning the special nature of the substance contained in the waste. “Looking at our system we have been able to locate 2 incidents around the area in the last 15 years. However both incidents were suspected deliberate grass fires and I have found no record of any incidents at the actual pools. The West Midlands Fire Service has set operational notes for dealing with hazardous materials, please find relevant operational notes attached. This reply was surprising to us given that firemen that we had spoken to recalled several incidents that they had attended in the area. It also did not cover the period of the documented fire in 1989. So we asked another question refering to the documented incident in 1989. “Further to you’re email dated 30th March 2010 requesting information prior to 1995 and specifically information relating to an incident that occurred on Sunday 8th October 1989. Unfortunately our incident records do not go back as far as 1989 and I have therefore been unable to locate any information about this incident. It should be noted that “historic records at this site could not be located. Furthermore with its creation in 1974, the authority would not have been responsible for incidents on this site before then. Albright and Wilson and Rhodia had and have their own fire brigade, who train and have links to West Midlands Fire service. 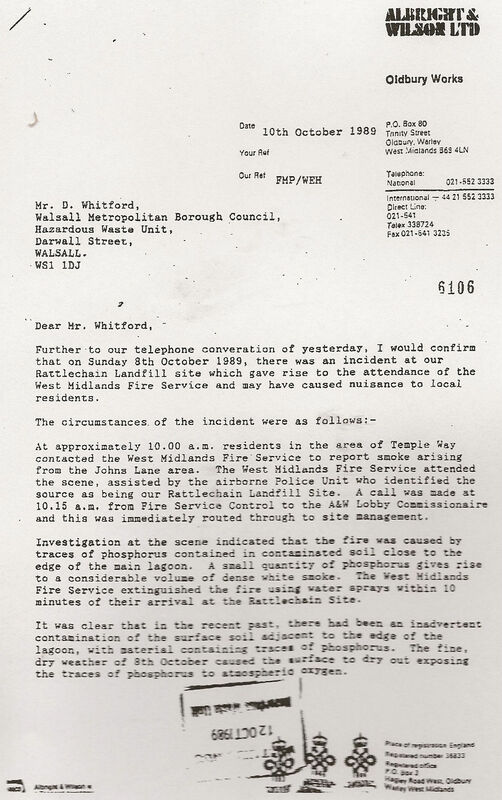 It is likely that “small incidents” involving white phosphorus fires would be attended by them first, unless concerned members of the public called 999, as was the case with this fire and the 1989 incident. The proffesional firemen could not get into the site to put the fire out, as they did not have keys to open the barrier gate in John’s Lane or the main entrance gate. As it was, Rhodia’s fire brigade attended (after I called them) and put out the fire using powder, the recommended method of dealing with a white phosphorus fire. As the fire service needed to see if “a site risk survey” should be carried out, we take it that no special arrangements were in place at the time of asking between the company and the fire service for dealing with the special circumstances of the waste contained in the lagoon.